I love having a massage. It is one of my indulgences next to chocolate. So when I received an invitation to a “sparty” (spa + party = sparty), I didn’t hesitate to go even if it’s in a far, far away land of San Juan. Located at the mezzanine floor of the Atlanta Center nestles a fun, affordable, relaxing and Earth-friendly piece of heaven – the Organic Rituals Spa. As I entered their shabby chic place, I immediately felt the welcoming atmosphere through their very contemporary, feminine interior. The cashier/receptionist counter has more of a business-type look which, for me, was great, because you’ll already know that they really mean business here. On the counter, I saw this tray full of very nice and colourful nail lacquers. According to the receptionist, these nail lacquers are “somehow” earth friendly because they didn’t contain “that much” of toxic chemicals. She also said that if their customers liked their products, they can avail it from them. Since their products are "kinda" organic, they are a little pricey, but I think if it is for the planet’s welfare, why not give a shot, right? I got to smell one of them, and I must say that compared to the typical nail lacquers, theirs are not that irritating or addicting to smell. More colors for color-loving gals! Upon sitting on their awesome couches, they offered us some tea, which we found really, really great! 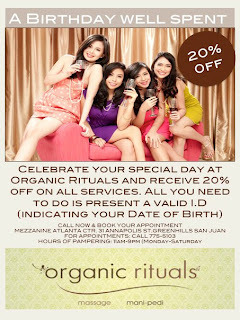 And since we’re on a bloggers’ party, the owner prepared some gimmicks for us to enjoy our experience at Organic Rituals. One of them was to fish out a piece of paper from the fishbowl to know what service we’ll be having from them, all for FREE! Fun, fun, fun!!! Luckily again, I fished out “Pure Back”. Pure Back is a body treatment which offers massage that helps reduce muscle pain and tension, alleviate stress, increase circulation and improve range of motion along the back area. The back is generously lathered with the customer’s choice of slat scrub and applied with strokes that will leave them relaxed all day. So without further ado, I picked my choice of salt scrub. Then, my choice of oil was Sweet Orange. While the masseuses prepares the stuff that she needs for my body treatment, I got a chance to appreciate more the interior of Organic Rituals. After some minutes, the lady who’ll be attending me called out my name and asked me to take a shower. Sadly, they only have one shower room with toilet, but nonetheless, I find it still pretty and well arranged. After I took some bath, (hehehe), I immediately went to my room where these simple yet very clean stuffs were waiting for me. Sadly again, they didn’t have lockers, but they do have a basket under the bed where guest can leave their stuff. That's where I kept my pants and shirt that I'm wearing that day. After some minutes of mild massages, Ate applied some mango salt on my back and started scrubbing it. I thought it’ll hurt, but I was wrong. It was my first time getting that kind of treatment, and so far so good. She spent almost 30 minutes applying oil, adding mango salt and scrubbing my back. Afterwards, she slowly removed the rocky salts on my back using a cloth damped in lukewarm water. Then, she immediately followed it by a very soothing massage, still using the Sweet Orange oil. Next thing I know, I was already in Japan running under the falling cherry blossom leaves. Hahahaha! Since I was unconscious after the scrub, I think Ate spent another 30 minutes of massaging my back. It was really good. She really knows how to put her customer into total relaxation. Hehehe. Thanks, Ate! After that two-thumbs-up Pure Back treatment (which I’m still enjoying til now as I’m writing this blog), I went back to the manicure-pedicure area where I saw my fellow bloggers enjoying their own treatments. After our own treatments, bibingka for merienda was served to us. Yummy! 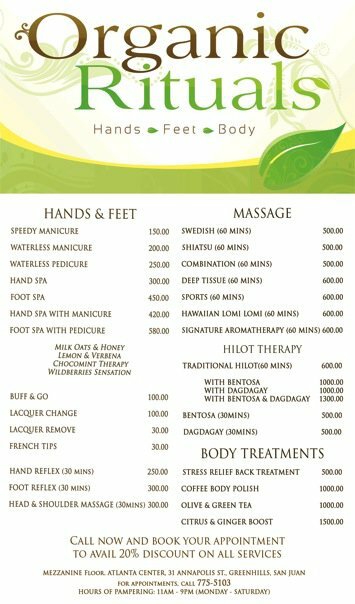 Also, Organic Rituals Spa has their own nutritionist who offers some help to their customers to effectively release all the toxins in their body. 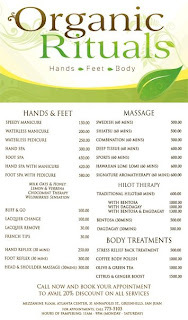 Here are the other services that they offer. It was a great, relaxing, sparty-terrific event that we all enjoyed. Thank you, Organic Rituals Spa! I’m looking forward to experience your Traditional Hilot with Bentosa! Organic Rituals Spa, love, love, love! Now, who's birthday is coming?